Kensington's recipe for this bag was simple. It took a premium computer carrying case and sent it to a group of ergonomists. It had them look at how the case was used, so that they could think from the bottom-up about how to make the perfect bag. In the process, they added a few new features - like a sculpted pad to bring the weight of the laptop closer in to your centre-of-gravity to help reduce neck and shoulder strain. 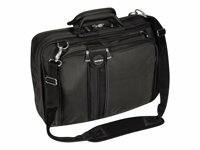 Or like an elasticized shoulder strap to help reduce shock as you carry the laptop on the road. Or special carrying handles to help reduce hand strain.